Seaweeds, a type of macro-algae (a group that includes benthic [attached to the bottom] marine algae that are typically visible to the naked eye), provide hope for a more sustainable future, through healthier food, renewable energy and fewer plastics. Over the last few years, not only have scientists developed a growing interest in these multi-talented organisms, but so have commercial enterprises. 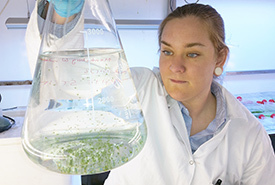 To understand how seaweeds could contribute to a sustainable future, and how these ecosystems are under threat, I spoke with Dr. Sophie Steinhagen, an award-winning phycologist (a person who studies algae). 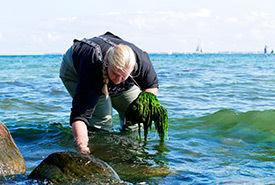 A seaweed expert, Sophie currently works at the GEOMAR Helmholtz Centre for Ocean Research in north Germany. 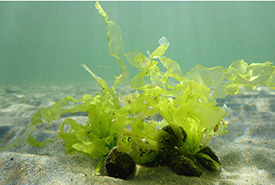 Samanta Hoffmann (SH): When we talk about seaweeds, most people probably have the image of "green sea lettuce" in their minds. But isn’t the world of phycology (the scientific study of algae) actually much more colourful and diverse than we think? Sophie Steinhagen (SS): Absolutely! There is a great diversity of seaweeds that haven’t even been completely explored yet. There are — and this is really roughly summarized — three main types: green, brown and red seaweeds. Moreover, they appear in different shapes and sizes. You can find them, for example, as single cell organisms or as 260-foot-long kelps. Some are leaf-shaped, while others consist of thin filaments. They exist in all climate zones, from the tropics to the Arctic. SH: What can seaweeds teach us? SS: Seaweeds are important, for example, in the evaluation of an ocean's health. This means that we can look at certain organisms as an ecosystem's voice, and by the appearance or lack of those species, the health of our aquatic ecosystems can be determined. The dense kelp forests that are associated with some temperate and Arctic waters are the foundation of a rich and diverse ecosystem. 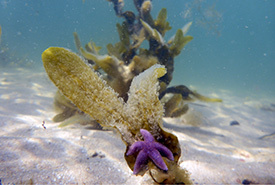 Unfortunately, ocean warming and the increasing acidification of our oceans bring an uncertain future for kelp forests. SH: What practical applications do seaweeds have in our daily lives? SS: Macro-algae are one of nature’s most biologically active resources. Over the last few decades, they have become an eco-friendly substitute material. For example, agar agar, which is mainly produced by red algae, is used as a substitute for gelatin and biodegradable plastics. Some components, especially of certain micro-algae, can also be used as substitutes for petroleum products. In Asian countries, the economic use of this sustainable resource plays a central cultural role. 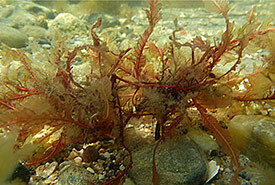 The western world focuses more and more on the various areas of seaweed applications. Everyday products already contain seaweed extracts. For instance, when you check your toothpaste's ingredients, you will most likely find carrageenan — a red algae extract that acts as a binder. And when you read your cosmetic ingredients, you will find alginate, a component of brown algae that is often used in creams. Seaweeds possess a wealth of bioactive compounds (food components that influence the physiological or cellular activities of the animals that consume them) that are used more and more in the areas of food engineering, pharmaceuticals and cosmetics. And some algae that have the potential to be farmed could become a main resource for renewable green energy. 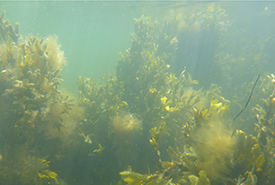 For example, seaweeds can be used to make biodiesel, kerosene, ethanol and lube oil. Interestingly, during the process of lipid production within an algae cell, a high number of carbon dioxide molecules get incorporated by algae. This means they could represent an eco-friendly energy source. The farming of seaweeds has become a lucrative business. Seaweeds are often used for various food products (for example, crackers and spices), drinks (such as teas), supplements and animal feed. SH: What are some risks to seaweed ecosystems? SS: Seaweed ecosystems face several threats, including eutrophication, marine pollution, overharvesting and climate change. SH: To sum it up, what does the above mean from a conservation point of view? SS: First of all, the development toward understanding and using seaweeds as more sustainable substitute materials in our daily lives is an important step in the right direction. If we use seaweed right, it could lead to a more eco-friendly future. But in view of some threats that negatively affect all ecosystems — water pollution, plastic, artificially added nutrients — we have to commit ourselves even more to marine conservation. And these ecosystems, in turn, affect us all. So, in the end, everything is just one big, closed cycle. Samanta Hoffmann is a German culture editor with a master's degree in American studies and ethnology. Read more about Samanta Hoffmann.